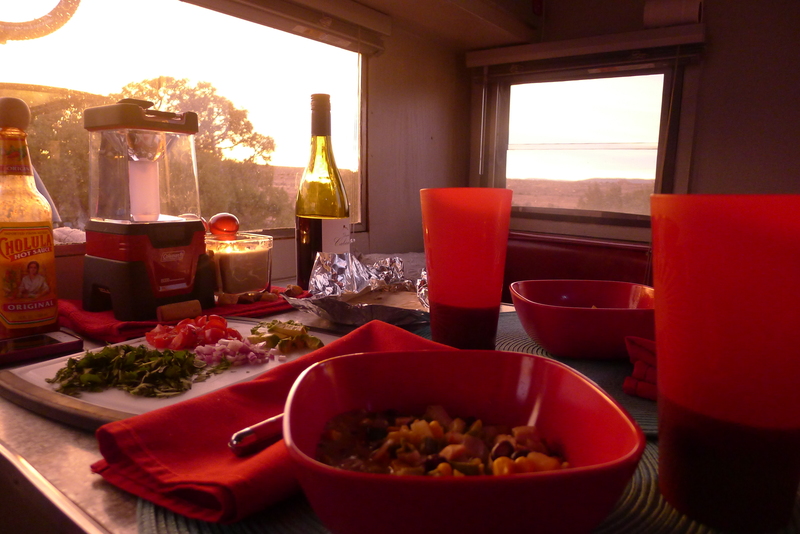 Camping food: How we eat on the road (and green chile enchilada soup). 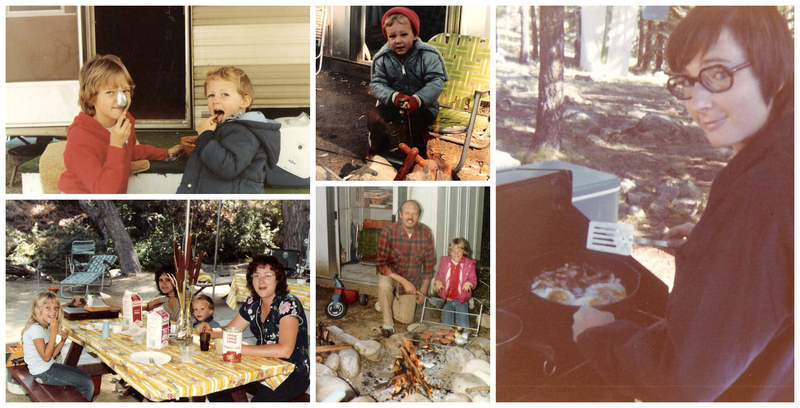 My folks love camping because theirs did, and now I do, too. 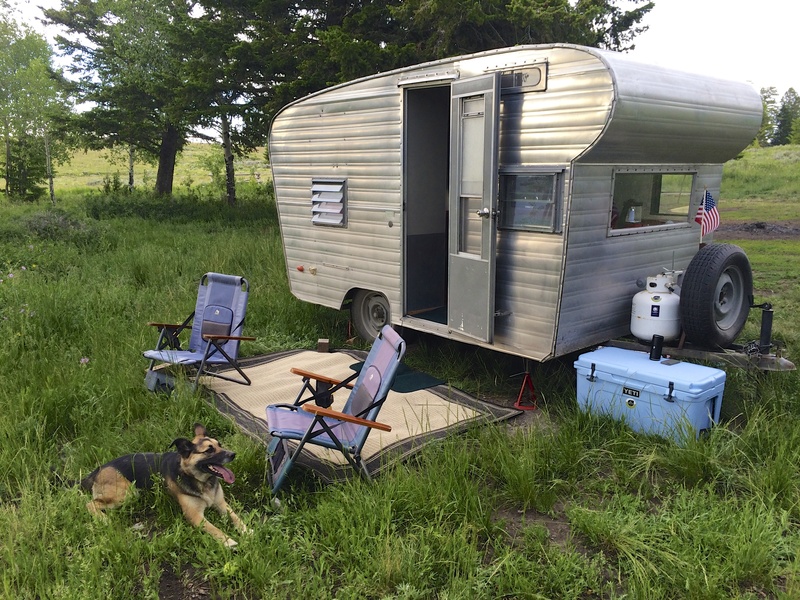 It’s no surprise that the man I married also enjoys it, though we didn’t realize just how camping-compatible we were until we spent 8 weeks (over two trips) in our teeny-tiny trailer together. 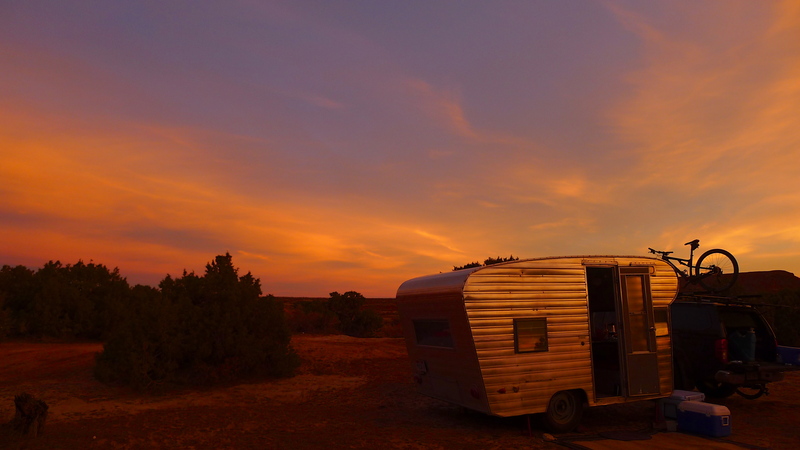 Betty the Trailer played matchmaker that summer, and we were married the next autumn. We adore her. Another thing John and I have in common is our love of good food. 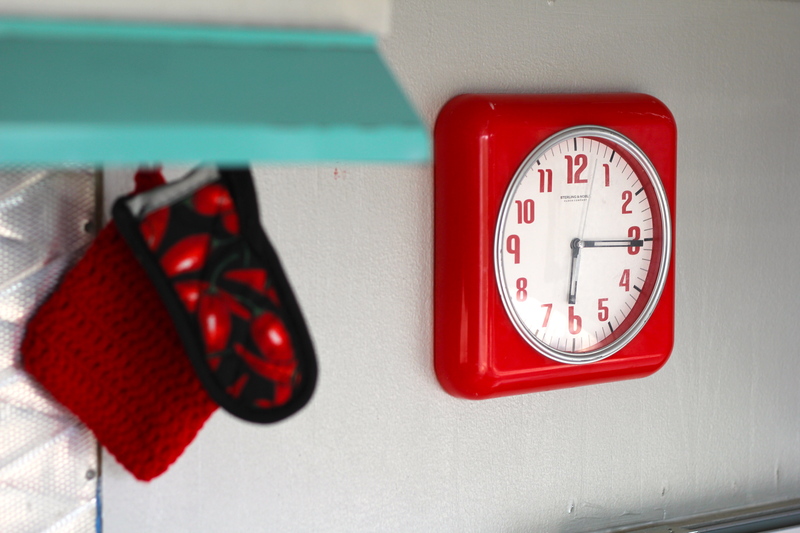 Though we enjoy eating out, some of our favorite date nights are at home in our kitchen together. We’ll put on some music, set out some snacks, pour a couple of drinks, and dance our way through creating a meal. 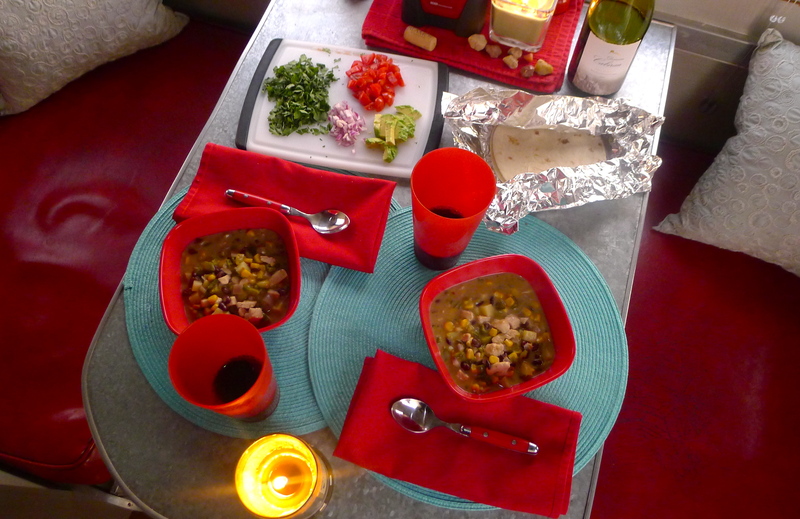 Then we clink our glasses over candlelight and savor whatever deliciousness landed on our plates. 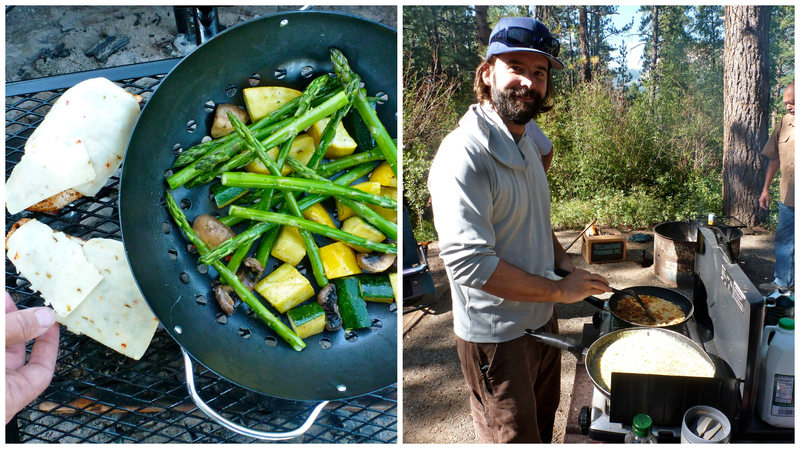 So it’s only natural that we eat well when we’re camping. 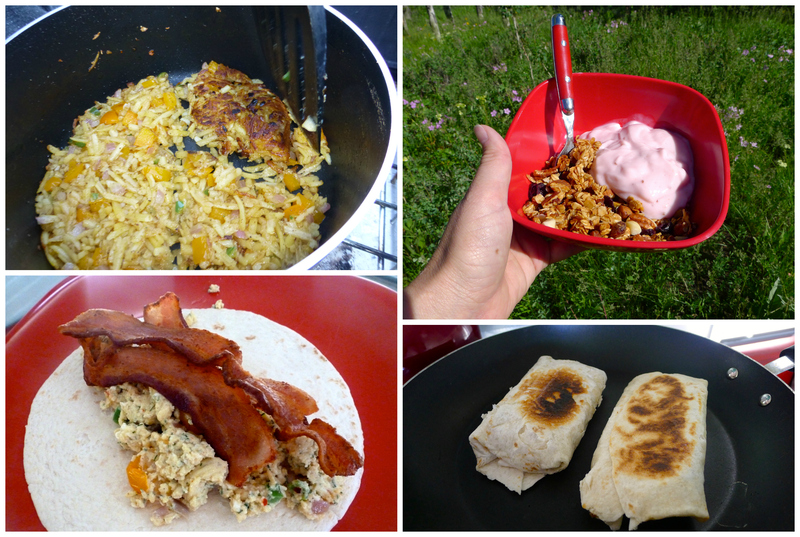 I remember “camping food” in college meaning bean and cheese burritos, basic burgers, or spaghetti with canned sauce. Now, we joke that we sometimes eat better on the road than at home. 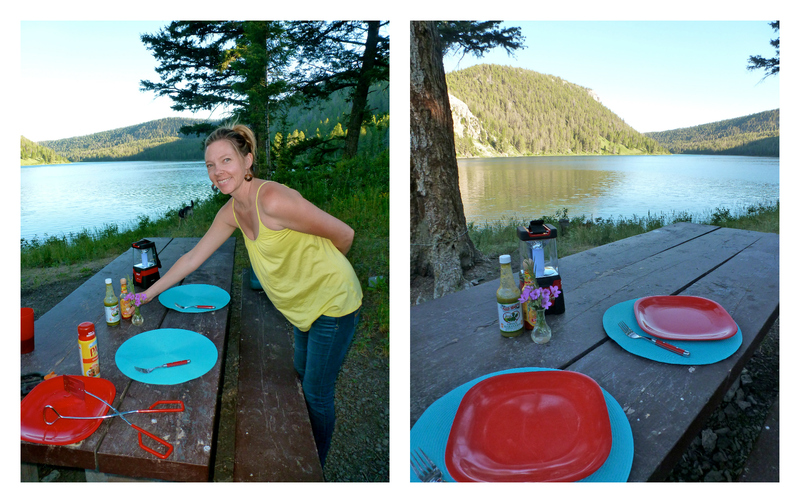 Our meals aren’t fancy, they really don’t take a lot of effort, and we enjoy the process: perfect outdoor eating. Disclaimer: this isn’t roughing it. We aren’t backpacking our dehydrated food to a remote campsite to cook on a Bunsen burner. 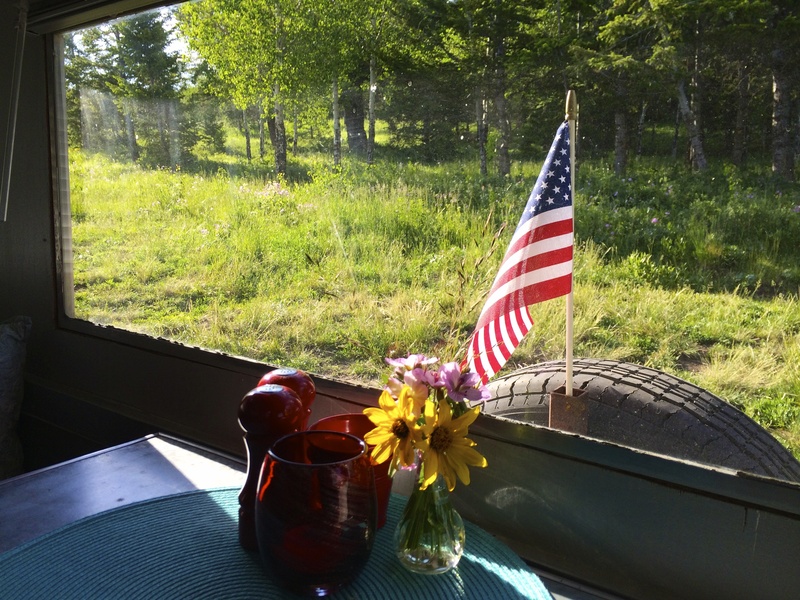 It’s car camping with a cozy trailer! 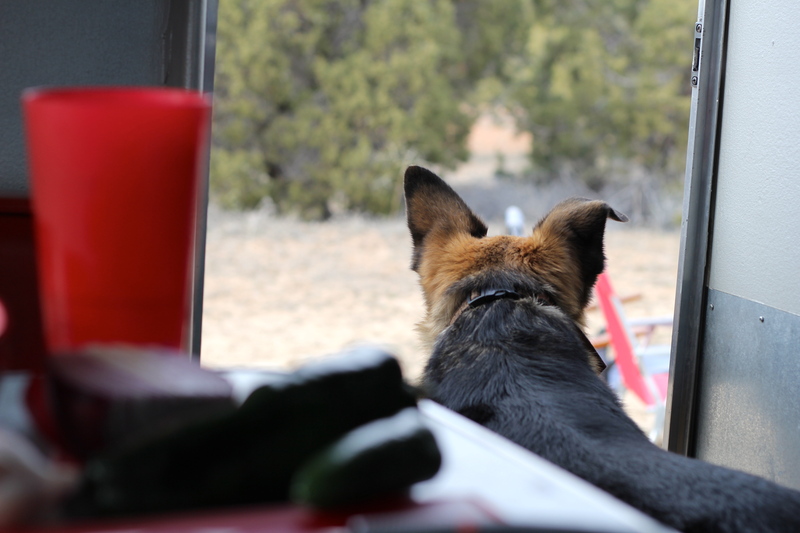 While we sometimes end up on BLM land (like McCoy Flats), we usually find basic campgrounds based on the tent insignia on our map book.That said, Betty’s size makes things challenging. 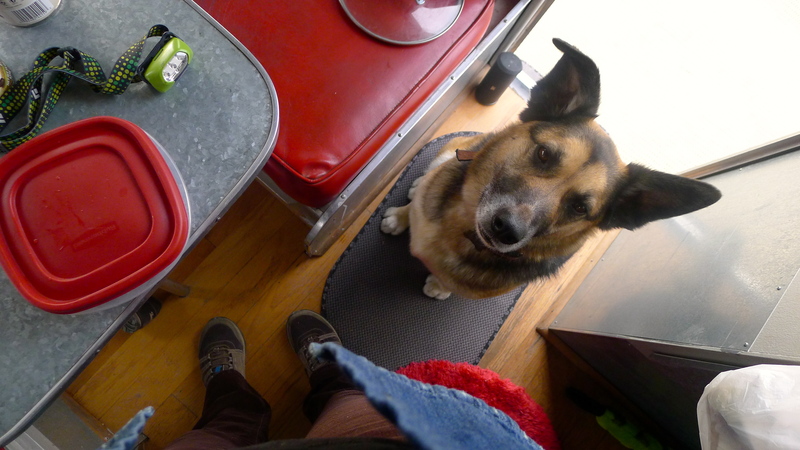 At 13 feet long, there’s not a lot of room to maneuver or prep food… or even for two people at once. 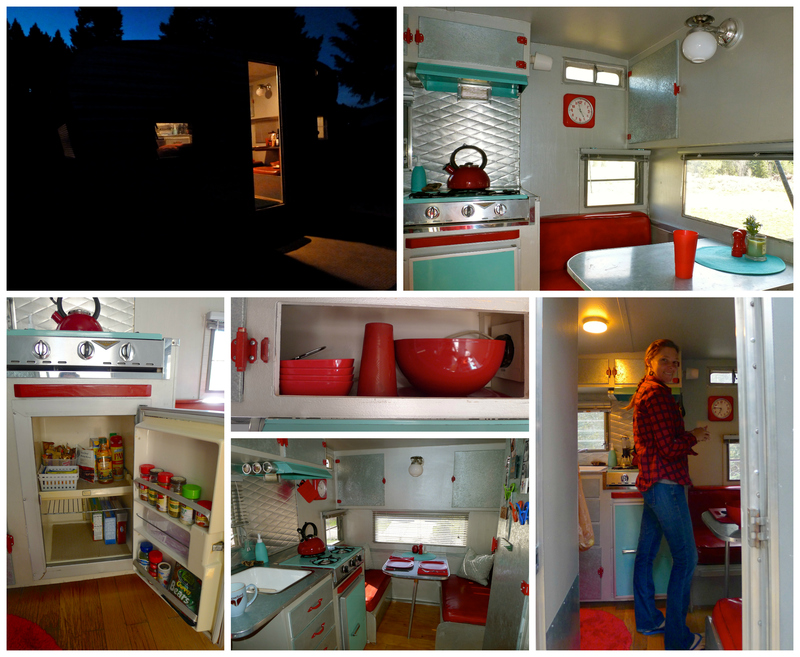 There is no oven, and only two of her three gas burners work. 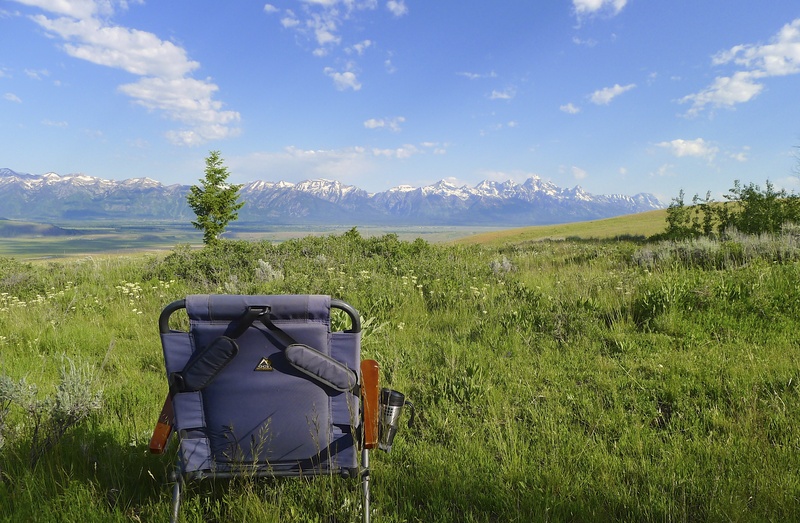 We have an adjustable grill for campsites that don’t already have one. We use the little ancient icebox for dry food storage and keep a stash of common spices in there. We use two coolers with ice to store anything refrigerated (one for food, and a smaller one for beverages). What doesn’t fit in Betty’s little compartments goes in the back of the truck, like the big old water jug. Since storage in the icebox and cooler is limited, we need to stock up on supplies every few days. That’s an opportunity to choose to eat fresh, even in the middle of nowhere. We eat a ton of fresh veggies and lots of salads. If we’re on an extended trip, we try to buy local produce, meat, and fish; it’s fun (and delish) to mix up our menus based on what’s available around us. Once, after swimming in the Rogue River, we stumbled upon a tangle of wild blackberry bushes and plucked bags filled with berries for breakfasts and desserts! Betty is outfitted with some basic cooking utensils, a frying pan, a sauce pan, a veggie grill basket, and a small soup pot. 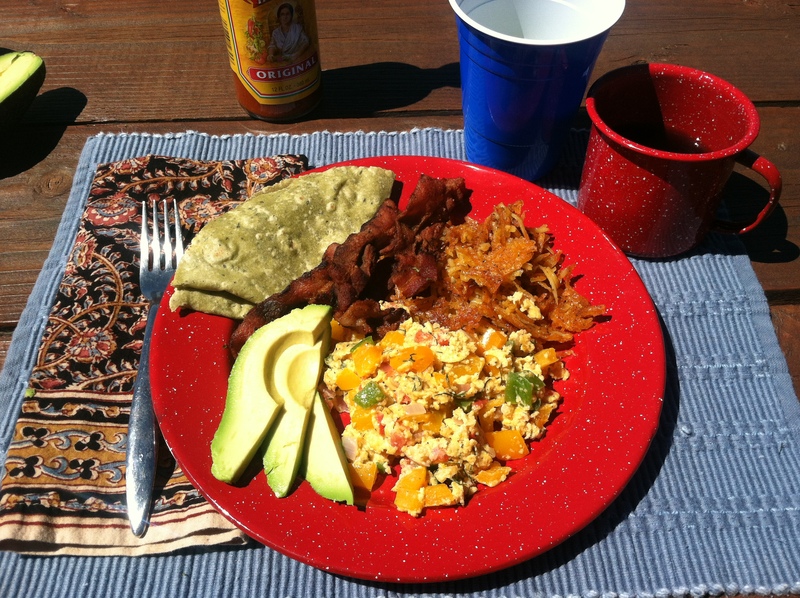 We have placemats, melamine bowls and plates, real silverware, and cloth napkins to reduce waste (plus it feels nicer). We light candles, play music, drink good wine (out of Betty’s plastic glasses), and often pick a few wildflowers from camp to put in a vase. 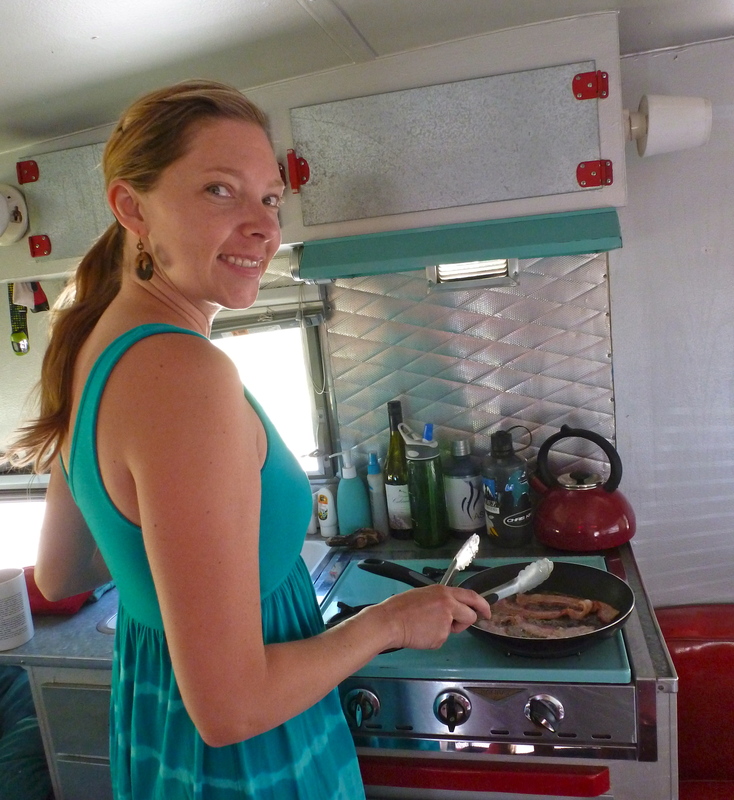 I like our little cottage-on-wheels to have touches of home, and mealtime is no different. To cut down on the amount of pre-packaged food we buy, we do a little bit of prep work before a camping trip. 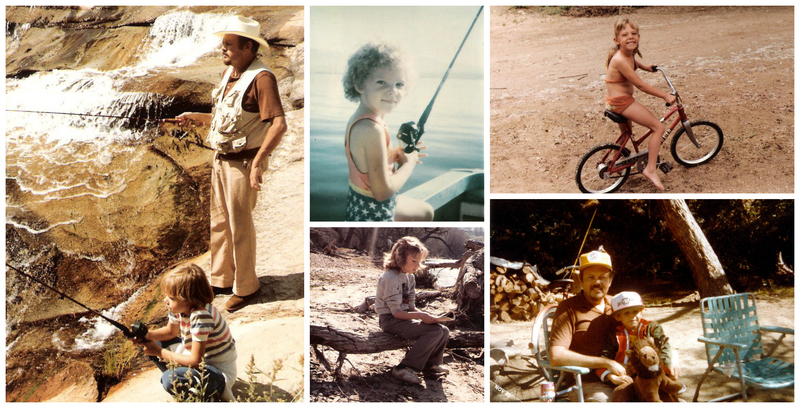 The more we can do ahead of time, the longer we can play outside once we get to camp! We plan a couple of meals at a time so we pack only what we need. Before we leave home, I’ll make a batch of granola, cornbread, or cookies. John might pre-make burger patties or marinades. I’ll pull stuff out of the freezer to thaw if I know we’ll be eating it within a day or two, like homemade breakfast burritos or biscuits. I might pick out one or two side dishes from the Whole Foods deli, or make something ahead of time, like Greek pasta salad or Nancy’s yummy barley salad. 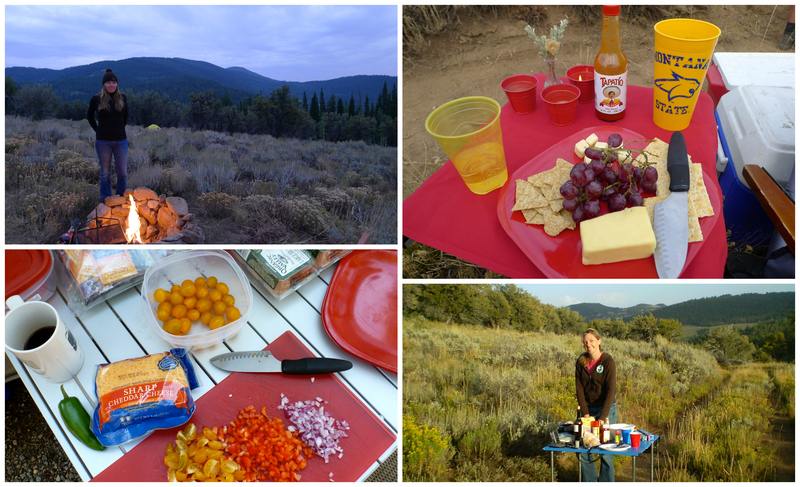 And we always have a few staples on our trips: cheese and crackers for happy hour, granola bars for hiking/biking, peanut butter and jelly for John’s midnight snacks, good coffee, tortillas, and- of course- plenty of hot sauce. The key to a happy life in old Betty (with two adults and a largish dog) is organization. Clutter doesn’t work in our tin box. Everything has its place, and when we’re done using something, it goes right back to its home. Betty has a little sink but we don’t use the water pump; we fill smaller containers with water from a huge jug in the truck. 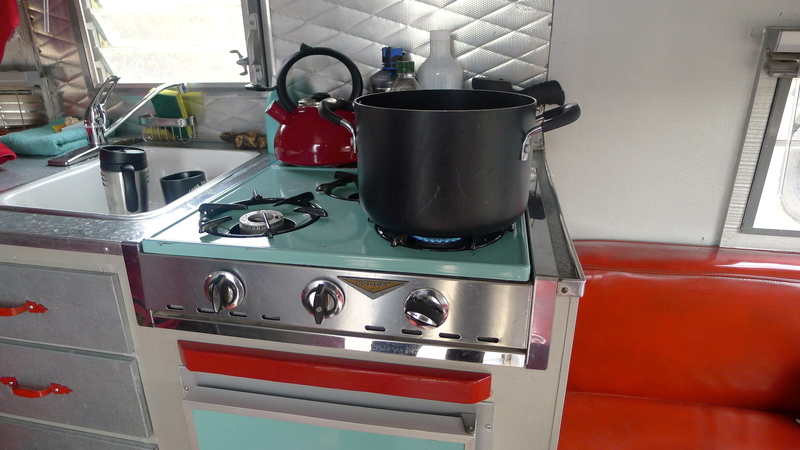 Washing and putting away all of the dishes after every meal means more space in the trailer and keeps things tidy. 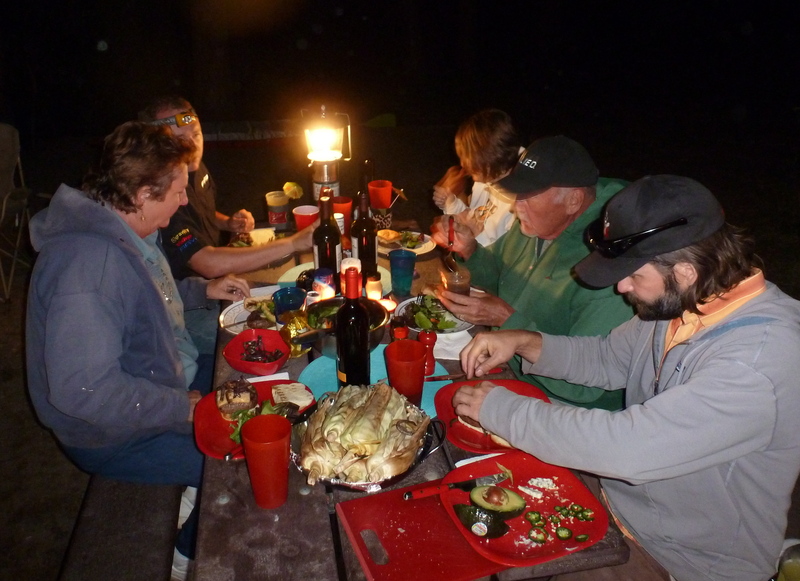 On a two-day trip, we usually do a dinner from the grill one night and something cooked on the stove the next night. 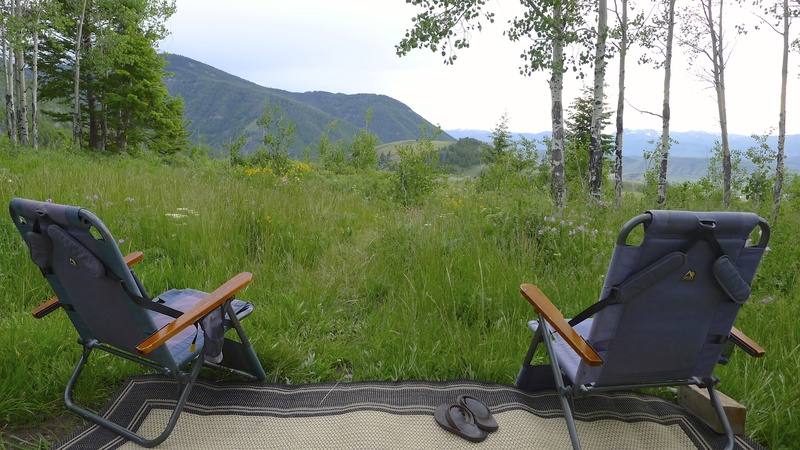 We eat outside whenever we can, including happy hour snacks, and will sometimes even do some prep work outdoors (more space!). 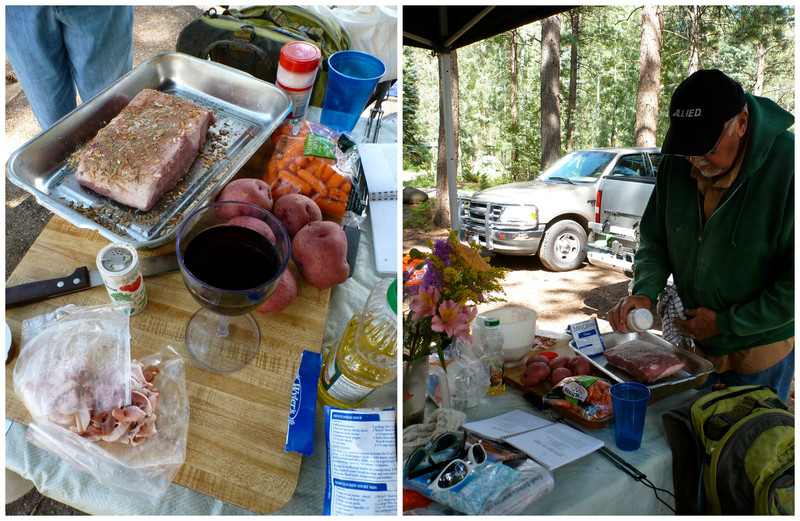 Even when we’re not in Betty (like this tent fiasco), we set up a prep table and bring along the Coleman stove and do most of the same stuff. 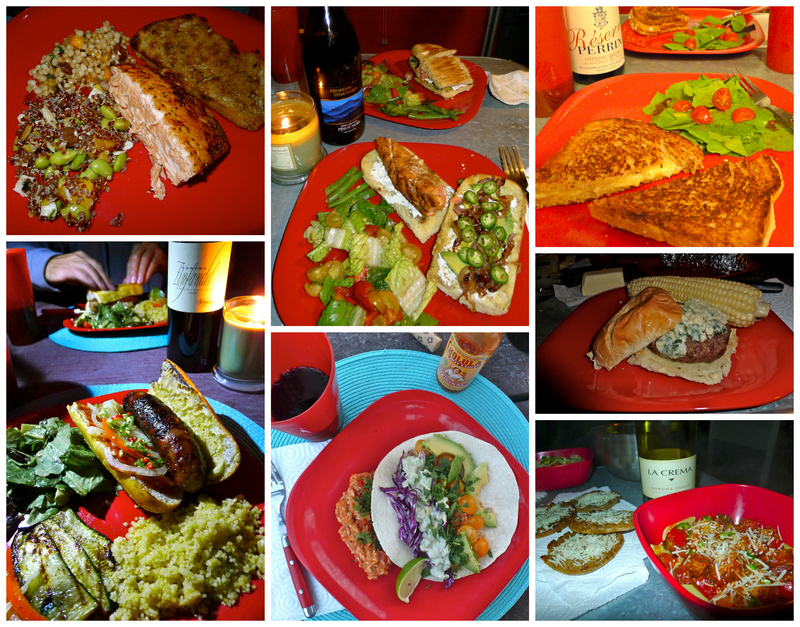 Some of our favorite dinners over the years: grilled fish tacos, salmon sandwiches, Peep’s chicken, brats with peppers and onions, simple skillet grilled cheese, fresh veggie stirfry with brown rice, every kind of burger, and I make a mean camp chili. Favorite side dishes: fresh salads, grilled veggies, couscous, Spanish rice, grilled corn on the cob, sweet potatoes charred on the grill. Breakfasts are usually granola and yogurt, scrambled cheesy eggs, hashbrowns, or bacon (obviously), but sometimes we’ll shoot for an omelet or make fried egg sandwiches or a breakfast quesadilla. Don’t forget hot coffee from the little French press! 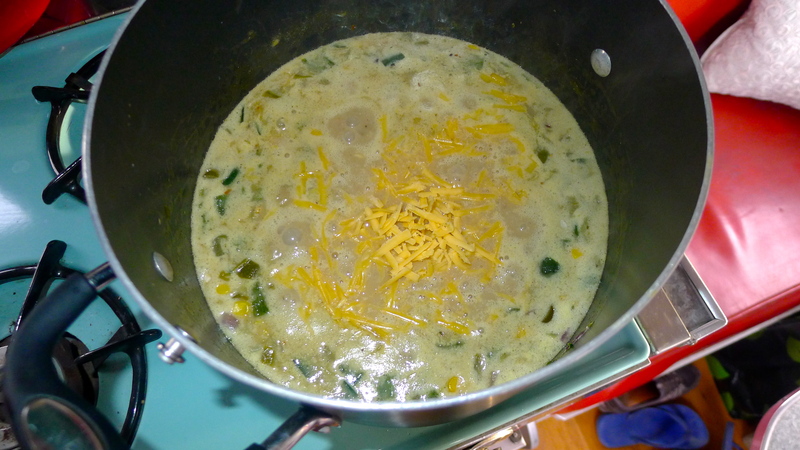 Last weekend, I tried a new recipe: green chile chicken enchilada soup. 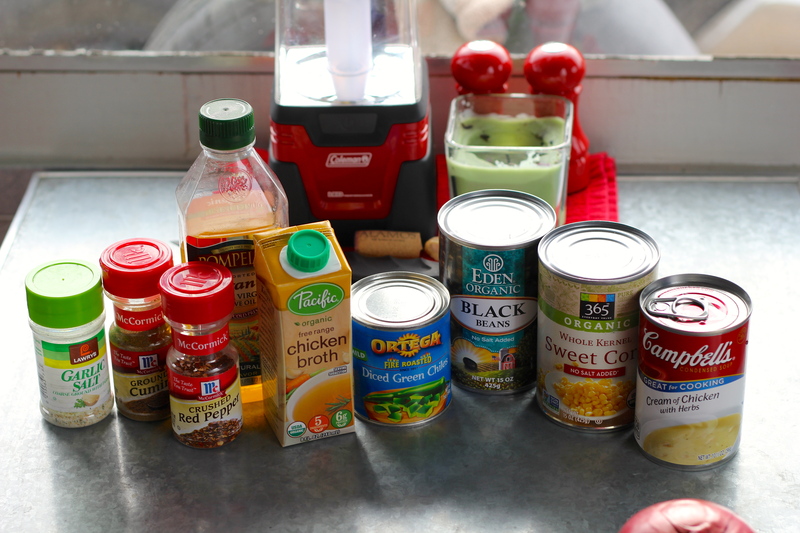 It basically takes all of the flavors from spicy enchiladas and turns it into a creamy soup. 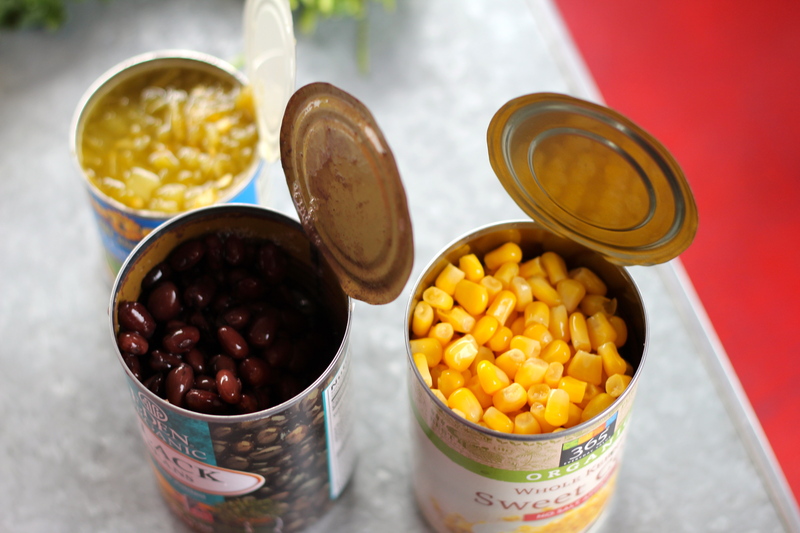 There are quite a few canned items, which makes it easy (as long as you don’t forget the can-opener). 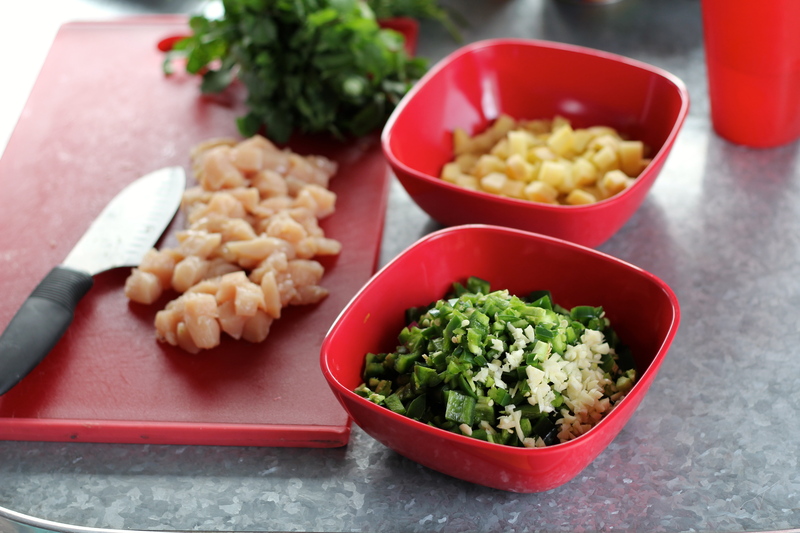 It also uses plenty of fresh ingredients, which balances out the flavors. 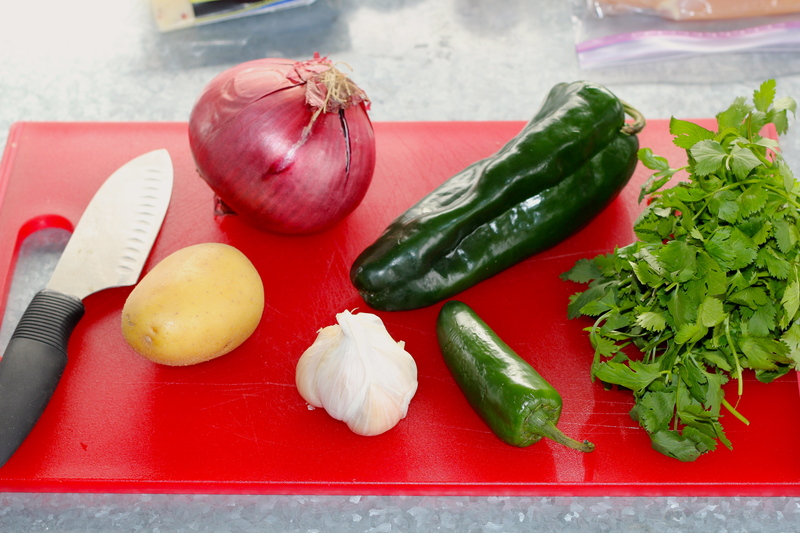 I started by prepping everything: cutting a chicken breast into bite-sized pieces and chopping veggies (onion, a poblano pepper, a potato, garlic, and jalapeño). I got the canned goods opened and ready to use: black beans and corn (both drained) and plenty of fire-roasted green chiles. In my little soup pot, I cooked the chicken in a little bit of olive oil. I removed it, set it aside, and dumped all of the fresh veggies into the pot. I tossed in a small handful of cumin and a few shakes of garlic salt. 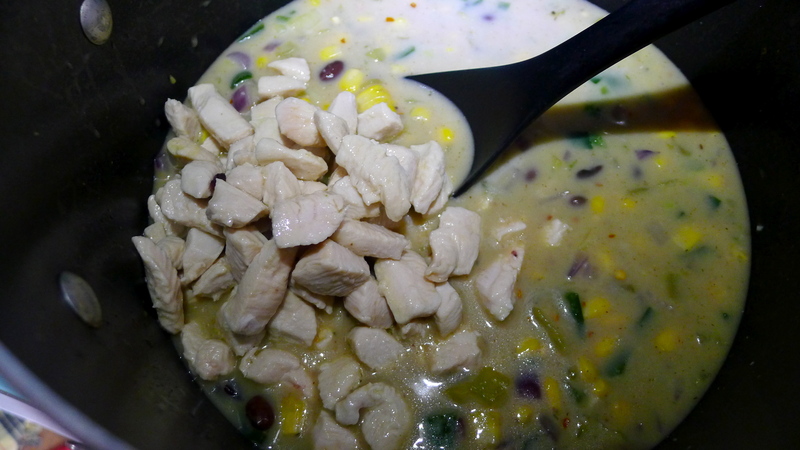 When the veggies started to get tender, I added a can of cream of chicken soup and the green chiles. 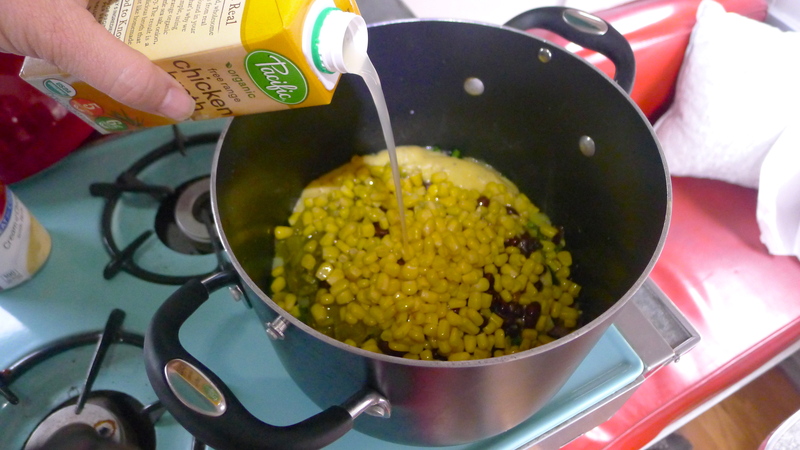 Into that mixture, I poured a little milk and a cup of chicken broth. I gave it a good mix and added the chicken back in, then let it simmer away while I freaked out about the incredible sunset. After a half hour or so (stirring the soup occasionally), I added the rest of our cheddar cheese, which was a heaping cup or so. When the cheese melted, I tasted it and adjusted the seasoning. 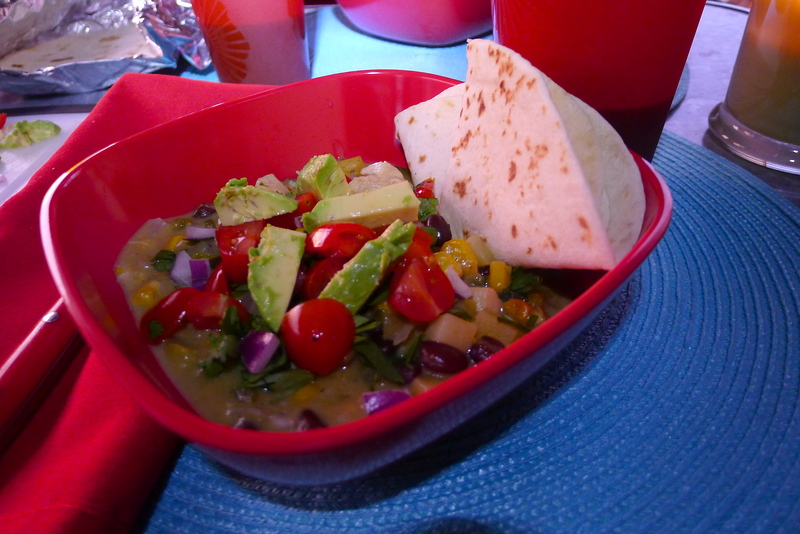 To add freshness, I prepared some toppings: chopped grape tomatoes, fresh avocado, some red onion bits, and cilantro. John warmed up some tortillas in a little foil on the grill. Chow time! This soup was spicy, chunky, full of texture and yummy enchilada flavor. The toppings were definitely necessary: their freshness balanced out the canned goods. You don’t have to be camping to love this one! 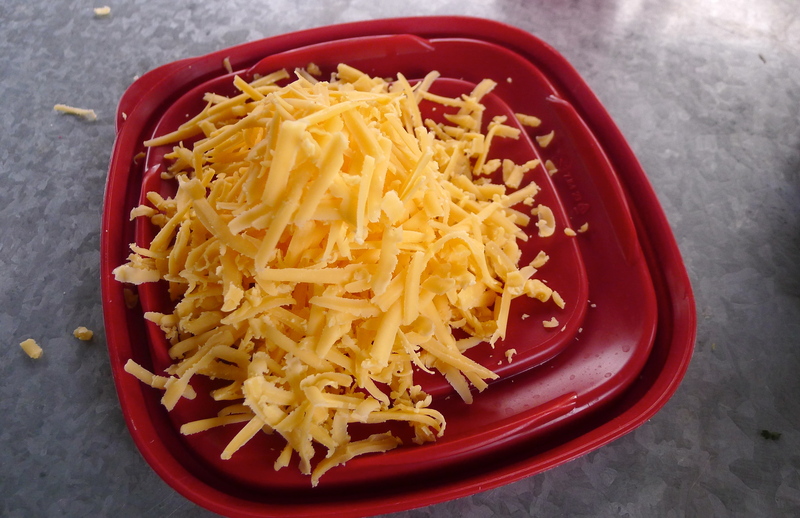 Next time, I might use shredded chicken (a rotisserie would make it even easier) and I’ll add more cheese. The best part? 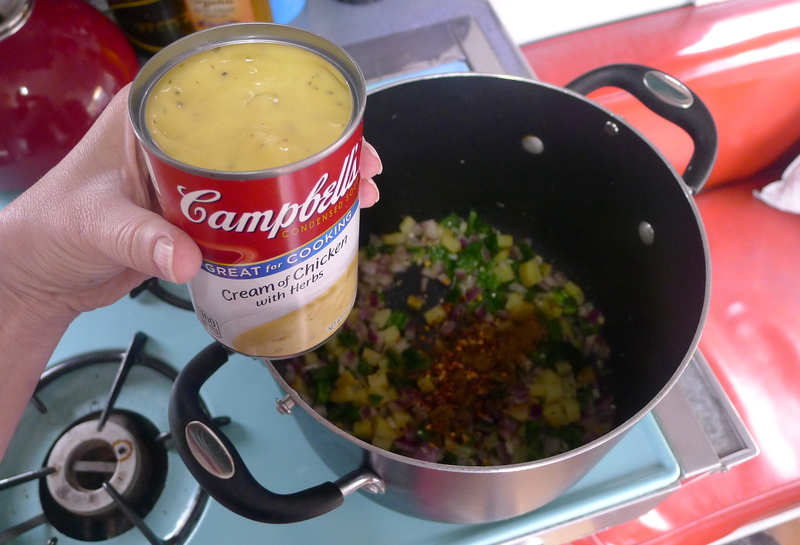 It’s a super-easy camp recipe, perfect for a chilly evening when you want something to warm you but don’t want to spend too much time inside or over a stove. 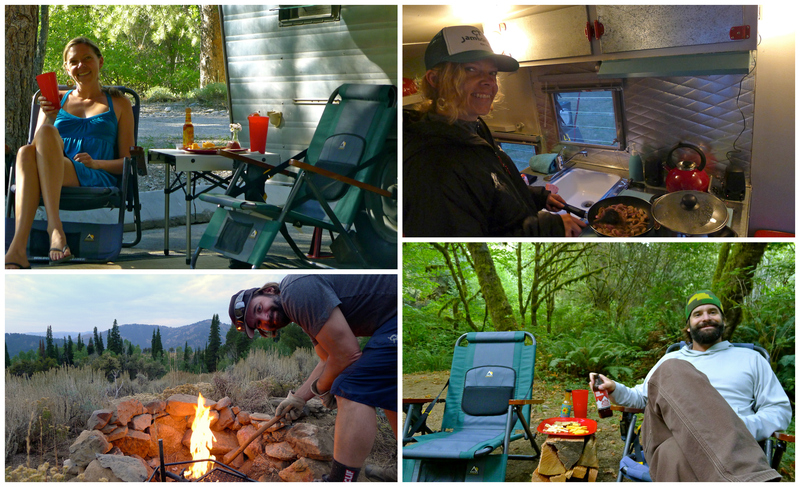 For us, camping is about soaking in as much of the outdoors as possible- sipping coffee in a field of wildflowers, exploring new trails, watching the sun set the sky on fire, seeing the campfire blaze and burn down to embers, and feeling grateful…with a belly full of good food. In a smallish soup pot, heat a swirl of olive oil over medium heat. 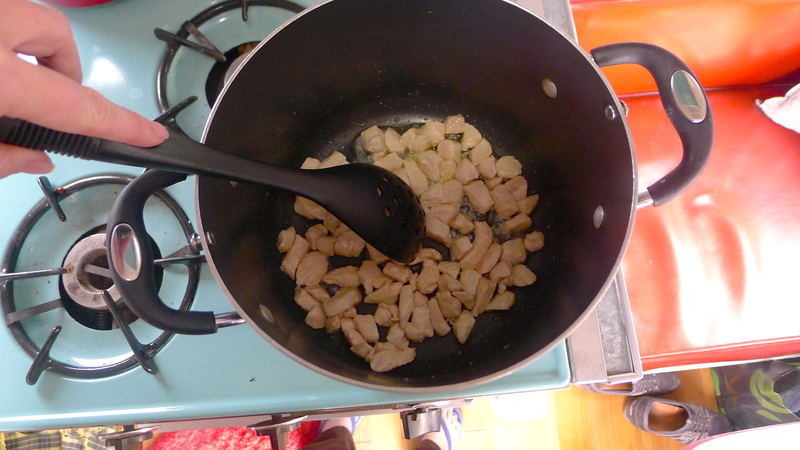 Add the chicken and cook through, then remove it and set it aside. 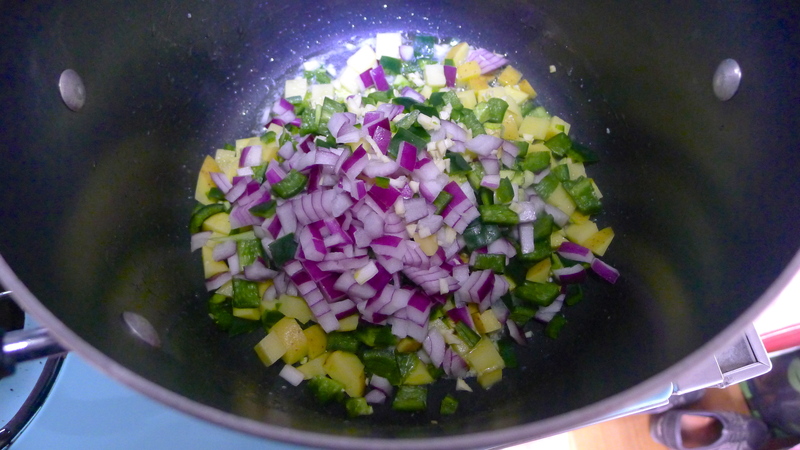 Into the pot, add the onion, garlic, jalapeño, poblano, and potato. Sauté the veggies until they are starting to be tender. Add the cumin, garlic salt, and crushed red pepper. 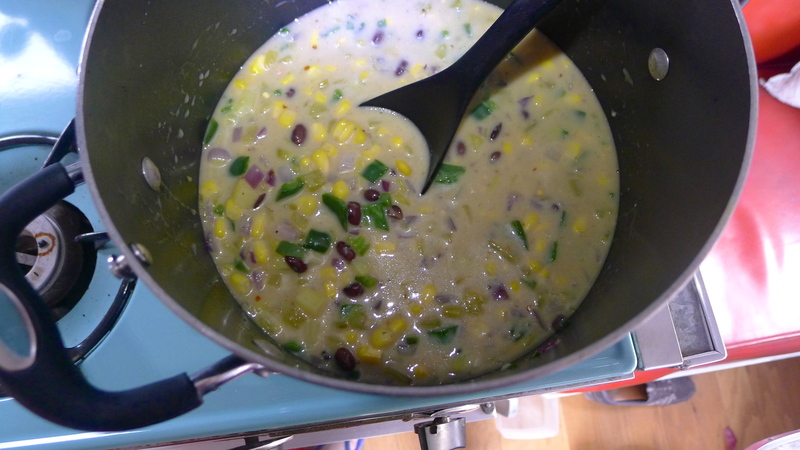 Stir in the chicken soup, green chiles, drained corn and black beans, chicken broth, and milk. Add the chicken back in. Allow to simmer for 20 minutes or so to let the flavors combine. 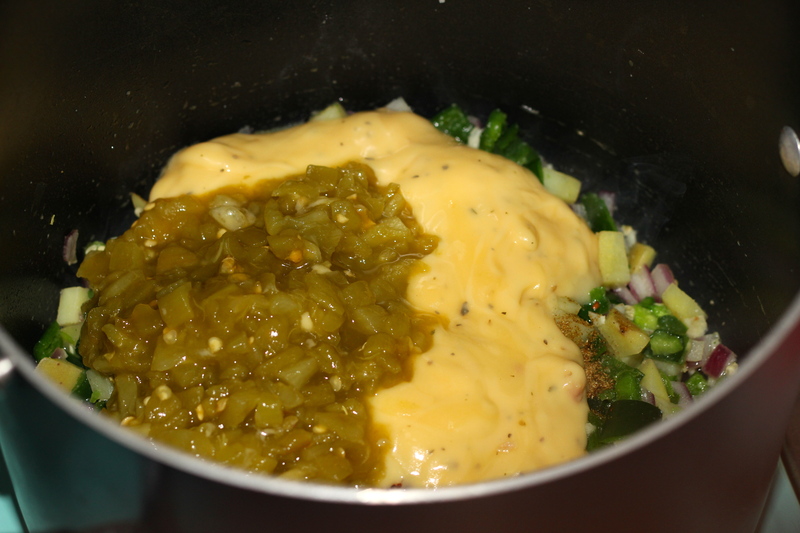 Stir in the cheddar cheese, reserving about a 1/2 cup for topping. 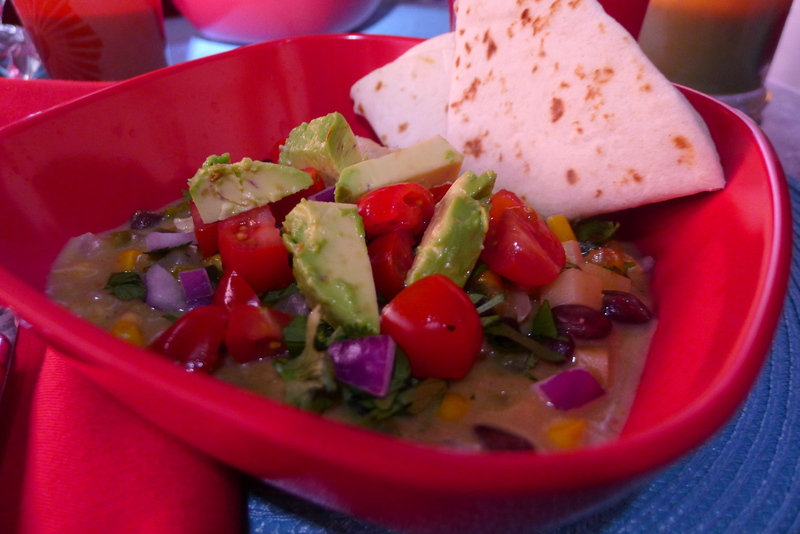 Serve bowls of soup with cilantro, tomato, red onion, and avocado with warmed tortillas on the side. 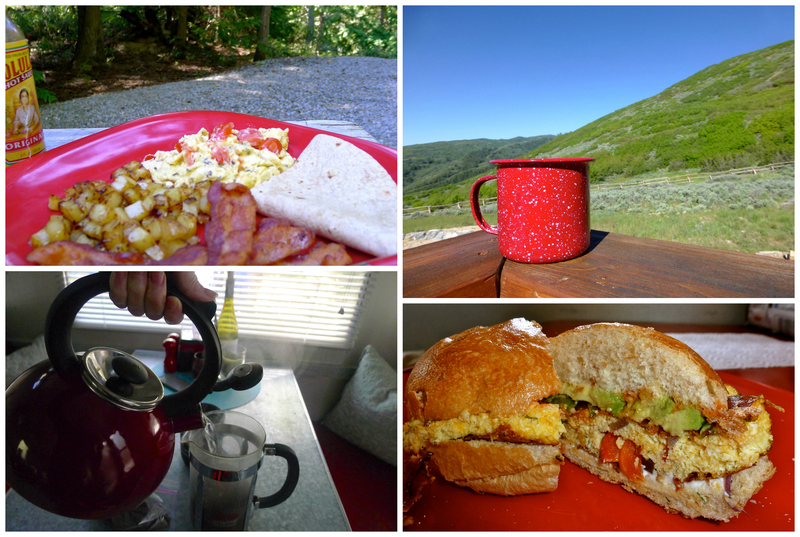 Clink a (plastic) glass to good food and camping season. YUM. 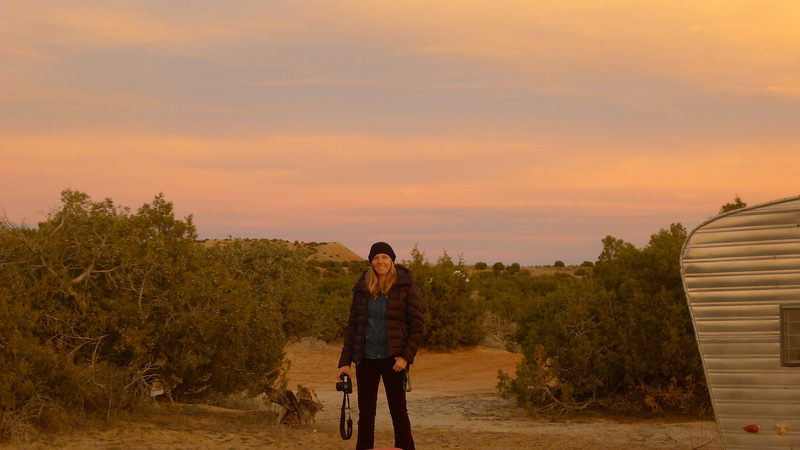 If you’re feeling a bit of wanderlust, check out the TRAVEL BLISS page. This looks tasty! And I love your camping style, I’ve never gone camping before but you’re making me want to give it a try. HOW DO YOU MAKE JUST REGULAR GRANOLA?